Beyoncé's Lemonade made just as much of an impact visually as it did verbally, in a similar manner to her self-titled album dropped in 2013, which saw each song accompanied with a video. As we now await the visuals of her Formation Tour, I cannot help but wonder: What will Beyoncé's Formation Tour outfits look like? As a master of her talent and curator of projects that encompass more art forms than music alone, there's no doubt in my mind that Beyoncé's Formation Tour will be an art piece in and of itself. Stylist Michael Costello has been signed on to develop the international tour's wardrobe — already hinting at one Beyoncé tour outfit through his Instagram. Since I imagine that budget won't be a problem for Queen Bey's tour extravaganza, I can only shiver with anticipation at what she has in store for audiences. When we consider Beyoncé's personal style and vision, as well as her past performance outfits, we can hazard a pretty good guess as to what Queen Bey is going to be rocking for the Formation Tour. But remember: We will only know for sure after the Apr. 27 debut at Marlin's Park Stadium in Miami, Florida. The following guesses about her stage ensembles are only ~well educated~ speculation. The last two performances that Beyoncé gave, both pre "Formation" and post, have been filled of military and social justice-inspired looks. For instance, both The Black Panthers and Michael Jackson were referenced in she and her dancer's outfits for her controversial (but outstanding) Superbowl 2016 performance earlier this year. An exclusive performance for Tidal customers in Brooklyn's Barclay's Center in Oct. 2015 also saw Nicki Minaj and Beyoncé in matching, pink and black, military-inspired looks. So it would be far from a surprise if Beyoncé continued this theme during the tour for her new and highly politically-driven work. As for her last tour in 2014, On The Run, where Beyoncé and husband Jay Z toured together, Bey rocked a number of different bodysuits. 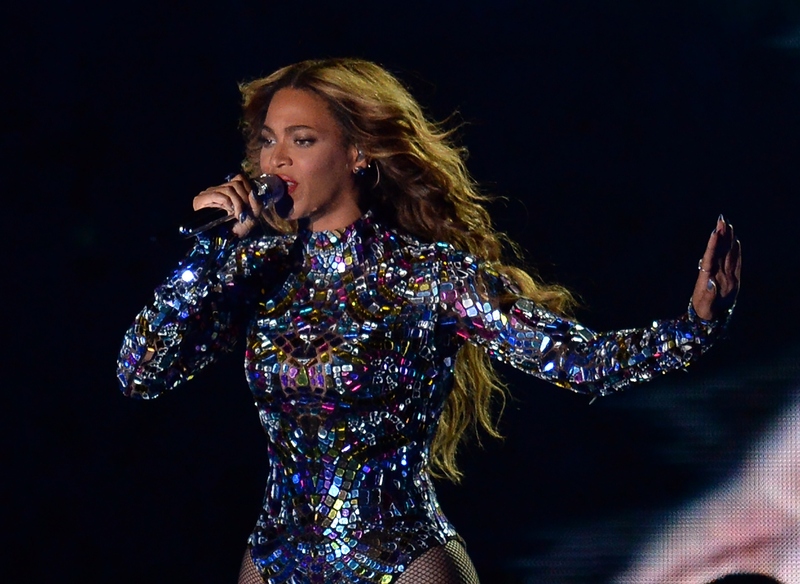 From chic, black, and skintight pieces to sequin head-to-crotch ones, Beyoncé's performance outfits tend to stick to this singular garment style. Even at the MTV Video Music Awards in 2014, Beyoncé rocked a gemstone covered one-piece. Although I'm not a professional dancer, singer, or performer, I can only assume this choice in apparel is down to practicality as well as style. Especially considering these kinds of silhouettes are favored on tour by the likes of Ariana Grande and Nicki Minaj, too. Before Michael Costello's costume hint on Instagram, it would've likely been a safe bet to assume Bey would be rocking some bodysuit magic as part of her world tour wardrobe. I also would've guessed that those suits would be embellished with sequins, gems, or glitter — just for the showbiz element. Costello's post has only served to fuel my predictions. Going by the number of bee emojis from commenters on his image, I'm going to say that the Bey Hive has already claimed this outfit at Yonce's own. Until curtains are up at the Formation Tour, none of us know for certain what Beyoncé has up her sleeve. But considering how perfectly she managed to keep Lemonade and Beyoncé secret, I doubt there'd be much public shock if Bey took a total T-turn and went for something completely unexpected.